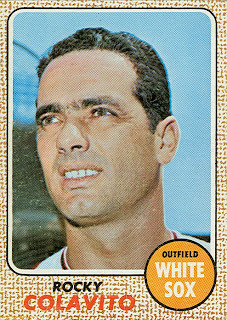 Here is the last card for Rocky Colavito (#99), one of the great American League sluggers of the late 1950s and early 1960s. Colavito started his minor-league career in the Indians' organization back in 1951, and played in such locations as Spartanburg SC, Reading PA, and San Diego (which were all Phillies' minor-league teams by the mid-1960s). He made his major-league debut in September 1955. He was the Indians' regular rightfielder from 1956 to 1959. 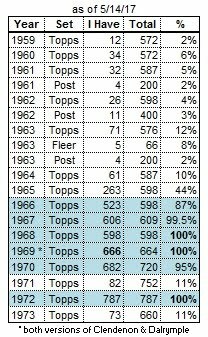 (For the first 3 years, Roger Maris was his backup!) In '56 and '57, he was 2nd on the team in home runs (after 1B Vic Wertz). In '58 and '59, he crashed more than 40 homers each year, leading the team. Colavito did not play for the White Sox in 1968, having been sold to the Dodgers in spring training. 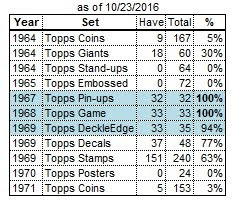 (This 1st-series card was already printed and in stores by then.) After playing in 40 games, the Dodgers released him in mid-July. The Yankees picked him up a few days later, and he appeared in 39 games before being released at the end of the season, bringing his 14-year career to a close. 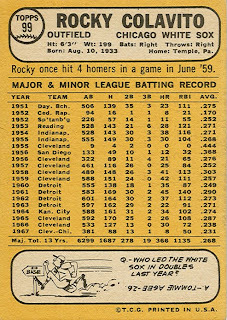 Rocky also pitched 3 innings in 1958 and 2 innings in 1968!